Yesterday we had the first high Tide of Autumn-Winter 2012. 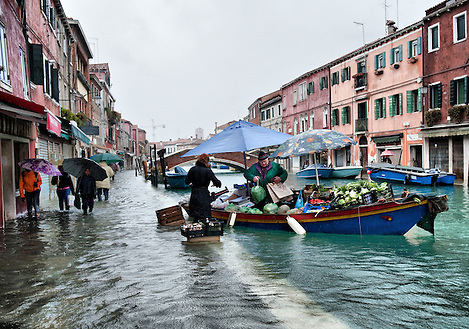 Generally Venice only has high water in Autumn and Winter and even then it is not every day that the streets are flooded. However when a higher than usual tide is expected in the city, sirens blare to warn the population so that they can prepare themselves. 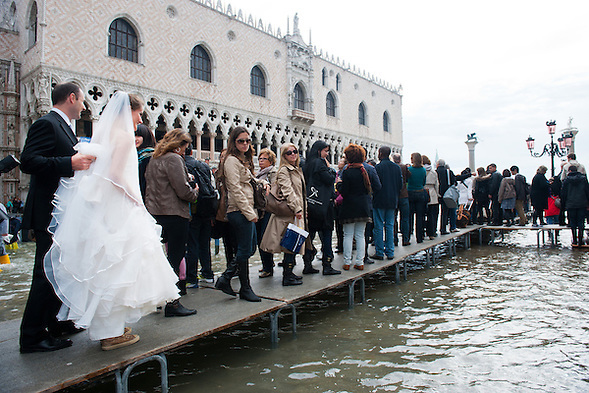 Maps as posted at the boat stops showing alternative pedestrian routes around the city that are equipped with special footbridges to avoid the high water and to reach the main parts of Venice. The causes of the tides are the following: - astronomic: the attraction of the sun and the moon cause the regular rise and fall of the water: "6 hours rise and 6 hours fall". You therefore have two maximums and two minimums a day. - meteorological: a strong south-east wind ("scirocco") may cause the tide to increase by as much as 1 meter. - geographical: the seiche is a sort of long wave that runs through the whole of the Adriatic Sea with a period of approximately 22 hours.